Sports are such an important part of life. They teach camaraderie, teamwork, and fun. Sports get kids outside and unplugged and keep them fit and healthy. Sports Day falls on August 1st, Basketball Day is November 6th, and Home Run Day is on April 23rd. And of course, football season opens in late August and really picks up speed in September. We are surrounded by sports and we love them! 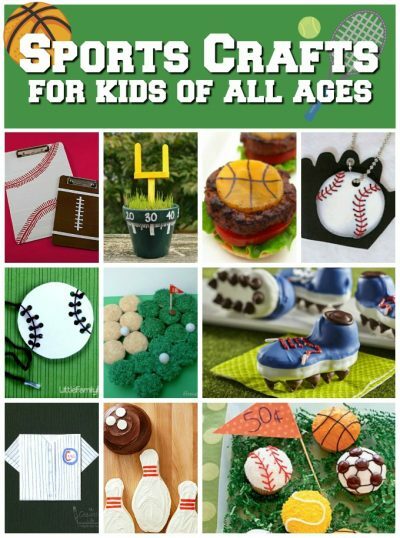 Sit down with the kids and browse through the pages and pages of sports crafts and recipes we have to offer, pick a few favorites and get creative! Below are ten of our favorites. 1. Origami Baseball Jersey – Turn a plain piece of paper into an origami baseball jersey, then decorate it to look like your favorite team! 2. Sports Cupcakes – Follow the simple instructions to make baseball, basketball, soccer ball, and tennis ball cupcakes. 3. Mini Basketball Cheeseburgers – Basketball fans will find these tasty cheeseburger bites hard to resist. 4. Baseball Lacing Craft – Help kids develop fine motor skills with this baseball lacing craft. It’s an activity they’ll want to do again and again. 5. Mini Football Field – Turn a clay pot into a football field. Kids will love watching the grass grow and ‘mowing’ it in preparation for Game Day. 6. Duct Tape Sports Clipboards – Sports fans, coaches and dads all over will love this easy-to-make gift. 7. Nutter Butter Cleats – These adorable cleats are made from cookies and candy. They are great fun for a sports-themed party, celebration or event. 8. Golf Cupcakes – Even cake decorating novices can make golf cupcakes. What a fun treat for any golf aficionado! 9. Baseball Charm – Create baseball charms to wear on a necklace, use as a zipper pull, or hang from a keychain. This makes a great team gift! 10. Go Bowling Cake – This bowling cake is perfect for a themed party or an end-of-season celebration for a bowling team. 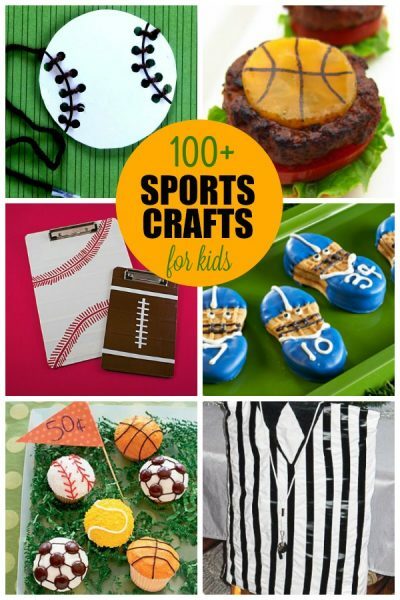 Don’t forget to check out the other sports crafts and recipes for kids. We have over 100 tutorials for kids of all ages!